A question from a friend recently prompted me to take a closer look at how gauge affects the amount of yarn you use. Lisa had nearly finished knitting a shawl which should have taken an entire ball of two-color gradient yarn. But with only a short section left to knit, she had barely started on the second color. The deep pinky-purple that was supposed to end up on the outer edge of her shawl was about to be cut off as leftovers. What had gone wrong? She checked her gauge and found it was 22sts per 10cm instead of 19. Eek. So her shawl was smaller than it should have been—15% smaller. But I realized that didn't mean she had used 15% less yarn, because the tighter gauge meant that her fabric was more dense. How much difference would that make though? And does it have any relevance to knitting in the real world? I already had a pile of swatches that I could use to test how yardage varies with gauge, made by knitters for a previous gauge experiment. 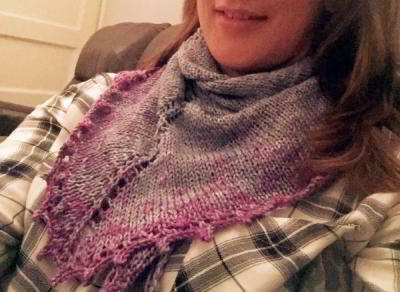 The knitters had all used the same yarn (DROPS Karisma), 4mm needles and had followed the same knitting instructions. The swatches still came out at very different sizes. I wanted to extend the gauge range further, so I made extra swatches with the same yarn. This time I used needles ranging between 2 and 6mm in size. Swatches on the left by different knitters using 4mm needles. Swatches on the right made by me on 2, 3, 4, 5 and 6mm needles. I used the weight and yardage information on the ballband and compared it to the weight of each swatch to work out the yardage for each. Since the swatches all contained the same number of stitches in the same yarn, any difference in yardage had to be due to something about the knitting itself. I charted the weight of each swatch against its gauge to see how closely linked they were. And if you who like numbers, here's a screenshot of my spreadsheet. When I first plotted the points on the chart above, I wondered if I'd entered the numbers correctly! These are the kind of clear-cut results that many scientists would love to get. All the points sit very close to an imagined 'line of best fit'. This means that two knitters working at the same gauge will use a very similar yardage. Or to put it another way, if you knit at the gauge given in the pattern, you'll use pretty much the right amount of yarn. This wasn't obvious to me before. I must have thought that some knitters could magically fit more yarn into their stitches without affecting their gauge! Remember that this is specific to this yarn. Even if another yarn had the same gauge according to the ballband it might not give the same results. But for yarns of similar fiber, weight and construction, I'm guessing that yardage requirements would turn out very similar. The scarf that I'm wearing is 20cm wide and 150cm long. My swatch-knitters would need between 363 meters and 438 meters to make the same area of fabric. That's 85 meters difference, the best part of a ball of this yarn. If your gauge is looser than it should be, you'll make a larger item and use more yarn. If your gauge is tighter than it should be then your item will be smaller and you'll use less yarn (the problem that Lisa had). If your gauge is tighter than it should be and the pattern tells you to knit until you reach a specific size, then you'll use more yarn. Designers do bump up their yardage requirements to cover knitters who use extra yarn. But my sample of knitters could still have problems (as well as the wrong-sized sweaters) if they didn't adjust their gauge. Take, for example, a sweater which is supposed to use 1200 meters (12 balls) of the Drops Karisma. If the pattern recommended buying 13 balls of yarn, one of the knitters would still run out and three others wouldn't need to break into the last ball. What happened with the shawl? Lisa contacted the designer—Helen Reed, aka The Wool Kitchen—who helped her work out that she could fit in a few extra rows and use more of the purple. I know, I'm like a broken record. But my better understanding of the relationship between gauge and yardage shows me one more reason to take a little time for a swatch.